Sports have a unique power to unite people from many different backgrounds. The most common aspect that brings sports fans together is where they’re from, whether it’s a local, regional, or national team. When the competition is on the world stage, countries vie for coveted titles, and a sense of national pride takes over. This stirring biopic tells the story of one of the most celebrated soccer players who came to prominence at just the time that Brazil needed a major win and a chance to prove itself on the international scene. The man who would become Pelé is introduced as a young boy playing in the streets of Sao Paulo, eternally excited by the notion of the game but more likely to get in trouble than anything else. His passion for the game is held back considerably by the state of poverty in which he lives. That doesn’t stop him from dreaming, and though he encounters a number of obstacles and setbacks along the way, he soon has the incredible opportunity to join Brazil’s national team and head towards the World Cup, a monumental event that may well put Brazil back on the map after a devastating surprise defeat in the previous games that has crippled morale in the country. This is a relatively standard biopic, one that presents its character at his humble beginnings and takes him all the way through to the impossibly high status of being considered the greatest soccer player of all time. The telling of this story, however, is exceptional, showcasing the enthusiasm young Dico, who will later adopt the negative nickname given to him and embrace it as his signature, has for the game. His style of play in particular is what made him unique, intent on sticking to the inventive and historical manner of playing that was seen as an antiquated embarrassment that was not suitable to represent Brazil. 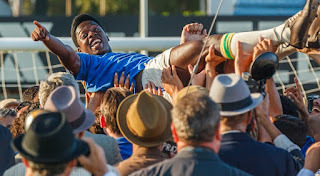 “Pelé: Birth of a Legend” does a magnificent job of conveying its protagonist’s ascension from unknown kid on the streets of Brazil to internationally celebrated star. The actors who portray him are well-cast, and the ensemble of the film contributes positively as well. It’s the film’s spirit that ultimately shines through, and its presentation of impactful games is particularly engaging. This reviewer is far from a sports fan yet still very much got into the scenes on the field depicted in this affirming and energizing film.